Located at the elevation of 3292 meters above from sea level, Basgo is a historical town situated on the bank of Indus River in Ladakh. It was once the cultural and political centre of the region and today is frequently mentioned in the Ladakhi Chronicles. It is well-known for its Gompas (Buddhist fortifications of Learning, Lineage and Sadhna) such a Basgo Monastery and historical shell. 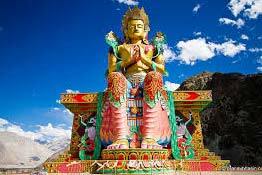 Basgo monestary, also known as Basgo or Bazgo Gompa, is a Buddhist Monastery located in Basgo in Leh district, Ladakh, Northern India. It is 40 km from Leh on Srinagar Highway. The monastery was built by Namgyal rulers in 1680 and is situated on top of hill towering over the remains of the ancient town and is noted for its Buddha statue and Murals. It was a cultural and political centre and has a feature of being the only place where original 16th century Murals still exist. The Monastery has three temples- CHAMBA MAITREYA (with Image of Maitreya on clay), SERZANG TEMPLE (with Copper built Image of Maitreya) and CHAM CHUNG TEMPLE (which was in the beginning built as Mosque but later transformed to Maitreya). 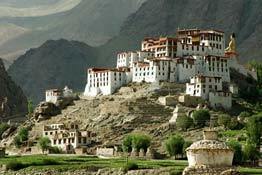 Also, this Monastery is documented as world's 100 most rare heritage sites in 2000-2001 by World Heritage Foundation. Basgo lies at a distance of 42 km, West of Leh. The Castle known as Basgo Rabtan Lhartsekhar is situated there on a Clay Hill. During the reign of Dharmaraja Jamyang Namgial and Singay Namgial, father and son duo built it. The principal Image here is that of the so- called Golden Maitreya, a sacred copper gilt image of Maitreya Buddha, with daunting two- storied in height. The Dharmaraja Jamyang Namgial is funerary built it to his Father King. There is also an image of Buddha Maitreya.